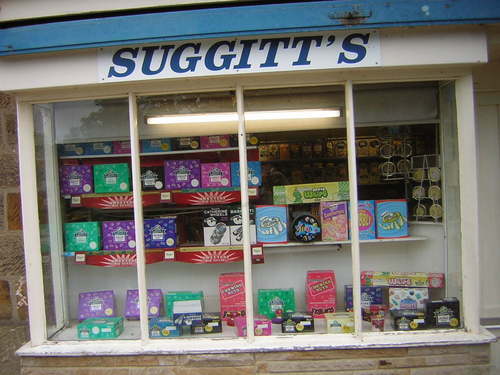 Great Ayton is best known gastronomically for Petch's pies and Suggitt's celebrated ice cream. The Ice-Cream shop, opened in the 1920's and is still extremely popular on a warm summer's day. There are nearly always queues for an Ice-Cream and sometimes people are able to get a seat in the Cafe. A great meeting place for Cyclists too. A POPULAR ice cream shop worker who died suddenly from a brain haemorrhage has been remembered by colleagues with a special tribute collection. 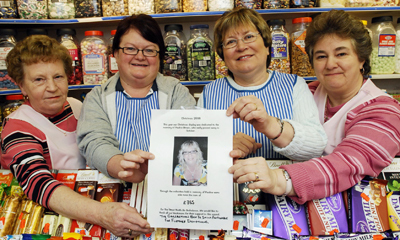 Staff at Great Ayton's Suggitt's Ices shop usually decorate their window for the festive period, but they decided this year (2008) to put a notice in the window asking for contributions to the Great North Air Ambulance in Pauline Brown's memory, pictured above Grace Maggs, Julie Dodds, Shirley Enticknap and Janet Breckon of Suggitt's Ices.